Anthropogenic semi-volatile organic compounds (SVOCs) are widely found in numerous matrices, including air, water, soil, indoor construction materials, certain consumer goods and foods. They include pollutants such as polycyclic aromatic hydrocarbons (PAHs), polychlorinated biphenyls (PCBs), phthalates and flame retardants, many of which are subject to regulation due to their known or suspected health effects. Reliable analysis of these compounds is therefore vital for many environmental monitoring campaigns, and increasingly for product quality control. 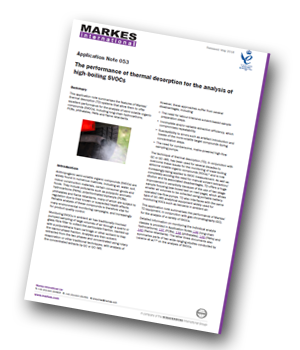 This application note summarises the features of Markes’ thermal desorption (TD) systems that allow them to offer excellent performance for the analysis of semi-volatile organic compounds (SVOCs), including long-chain hydrocarbons, PCBs, phthalates, PAHs and flame retardants. To download your copy of this application note complete the form opposite.